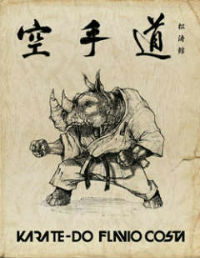 I did this one some time ago. I had to make a Woody Woodpecker animation for a comedy show. I did the scene in 2D, but they didn´t have time to get permissions, so I had to do it again and change the overall design to avoid copyright issues. I had already modeled Woody in 3D on my spare time and decided to do the same scene in Lightwave. 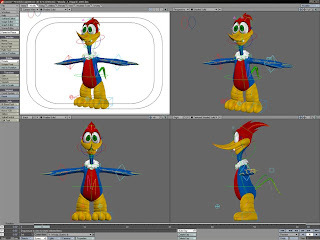 Then I´ve changed the model shape and colors and rendered the generic woodpecker. Woody, however, is such a charismatic character that I decided to render the scene with the original one from 1947. My shading and render knowledge are very limited, even in Lightwave, so Alexandre "Thunndro" Areal imported the model and point cache to render in Mental Ray. 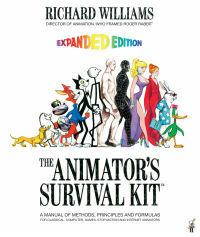 As far as I know I am the only Animator that had the pleasure of animating Woody both in 2D and in 3D on the same week. And they pay me for doing it!!!! Here´s some screenshots and the final render from Mental Ray. 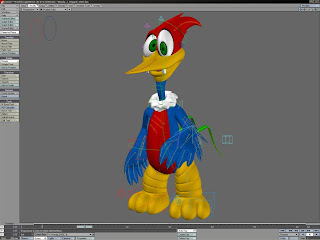 Woody Woodpecker from Marcos Piolla on Vimeo. Muito bomm, essa versão 3d desse clássico! show de bola! Q massa é a versão q eu mais curto.. bem lokãoo.. parabéns pelos trampos! Isso ficou sensacional meu amigo. Acompanhei todo o processo e só posso te dar os parabéns ao produto final !